Cadillac had a simple formula since the 1950s and that was provide the buying public with the biggest, most luxurious, and technologically advanced stylish automobiles and watch the profits come a rolling in. And this formula worked flawlessly until the 1970s when government regulations and skyrocketing fuel costs pinned Cadillac’s back up against the wall. Cadillac was forced to downsize its entire fleet of cars. The big problem was how do you offer more with a car that’s less weight and much smaller overall mass. The long flowing lines that Cadillac buyers had loved really only worked on gigantic automobiles. For the buying public had been trained since the end of World War II, that small automobiles meant cheaper and less expensive automobiles. Government regulations and high fuel prices were now making fuel economy the new game in town, and by the late 1970s a more than two-ton Cadillac with a 500 cubic inch V8 engine just wasn’t going to cut it anymore. Cadillac saw the writing on the wall and reacted quickly, much quicker than its rivals Lincoln and Chrysler, and promptly went the downsizing route. First was a new 1976 Seville, a compact Cadillac that was a tremendous hit with the buying public. Next came the downsizing of the entire full-size lineup in 1977, also a big hit. Cadillac surprisingly had managed to give these downsized cars long elegant lines. And with the Seville, Cadillac used an optical allusion in styling – it was the boxier more angler styling that allowed the Seville and Cadillac’s new smaller full-cars look bigger than they actually were. Also helping to trick the buying public was Cadillac engineers on both the Seville and the 1977 full-size lineup managed to make the interior cabins very spacious along with the trunks – in fact some of the dimensions were larger than the previous bigger models. In other words there was no wasted space on these cars. And Cadillac buyers loved them. It seemed all was good even in the turbulent 1970s at Cadillac. 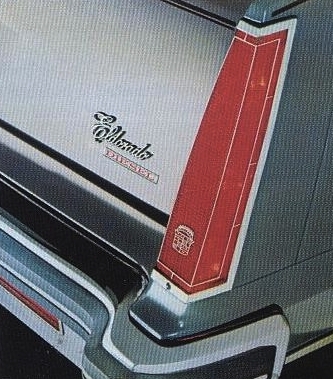 However by 1978 there was one last behemoth left in the Cadillac lineup – the Eldorado. 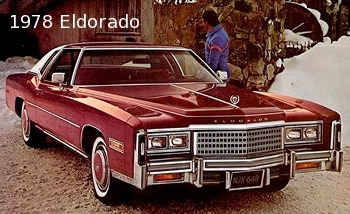 The Eldorado had begun the 1970s as the ultimate two-door luxury barge especially in convertible form. It was the epitome of excess – a big curvy luxury car with every option and luxury you could possibly imagine. By 1977 the convertible model was gone, but it still sold well however it looked out of place on Cadillac dealership lots, it was like Pete Rose being on the field today with the current crop of major league baseball players. Rose who has the most hits of any current or past major league baseball player is part of a baseball era which is long gone, same was true with the 1977-1978 Eldorado it was a reminder of a bygone era – at a weight of 4,906 lbs, length of 224.1 inches, and width of 79.8 inches it was the Jabba the Hutt of the automotive community in the late-1970s. However sales still remained strong since there were enough buyers still wanting to get their hands on this bygone era Cadillac – in fact willing enough to pay the high price starting at a little over $11K for the 1977 or $12K for the 1978. Cadillac went to work on downsizing the Eldorado while the big behemoth Eldorados were still flying off the dealership lots in heavy numbers. And the result was for 1979 a new downsized Eldorado was released to the buying public and it like the other downsized Cadillacs received a big reception. It was tiny in comparison to it’s predecessor with a weight of 3,792 lbs, length of 204 inches, and width of 71.4 inches. Comparing the Eldorado to today’s luxury cars it would be considered a full-size car – it’s only a few inches longer and narrower than a 2012 Chrysler 300. However though the Eldorado was a much smaller car than the previous Eldorado, it looked bigger than it actually was. The boxy styling especially the near vertical rear window provided the car a formal look along with allowing the trunk to have a long flowing surface giving the impression of a bigger car. If the rear window area had curved back like previous models the trunk would have looked too short and the car would have appeared like the much smaller car that it was. And a modern rendition of the Cadillac rear tail fin lights was there – a cornerstone of previous Eldorado models, so there was no denying this was an Eldorado. The long front hood and tall formal front grill area also aided in the optical allusion of a bigger. Yet all this more formal styling looked modern for its day. This type of innovative styling helped to lure in a lot of buyers and 1979 sales were way up at 67,436 units versus the 47,344 and 46,816 Eldorado production figures of 1977 and 1978 respectively. And this was no small feat considering Eldorado buyers were traditionally big car buyers and the base price for 1979 was over $2K more than the 1978 at an astronomical base price of $14,668. Smaller for the 1979 Eldorado also meant a much smaller displacement V8 engine. The 1978 Eldorado was powered by Cadillac’s big-block fuel-injected 425 CID V8 which produced 180 or in optional form 195 horsepower – both variants produced 320 lb-ft of torque. The 1979 Eldorado came standard with Oldsmobile’s fuel-injected small-block 350 CID (5.7 liter) V8 which produced 170 horsepower. Believe it or not the 5.7 liter V8 gave the Eldorado enough punch to make it one of the fastest new American luxury cars for 1979. It went 0-60 mph in 9.7 seconds and the 1/4 mile in 17.7 seconds which was the fastest performance times of an Eldorado since the early 1970s. As a comparison a 1970 Cadillac Eldorado with its 400 horsepower 500 CID V8 was good for 0-60 mph in 9.5 seconds and the 1/4 mile in 16.1 seconds, so you can see where the new downsized Eldorado was a step back to the better performance days at Cadillac. Optional was Oldsmobile’s 120 horsepower (220 lb-ft of torque) small-block fuel-injected diesel V8. Back in the late-1970s diesel engines were the rage – they were more fuel efficient, though lower in horsepower than comparable sized engines they did produce good torque numbers. So in luxury cars where buyers craved V8s with good low-end torque, the diesel 350 (5.7 liter) V8 seemed to be a good match. Especially since Mercedes by the late-1970s was becoming Cadillac’s big competitor and many of its lineup were diesel powered. However problems plagued the 5.7 liter diesel motor including premature failure of the head gaskets due to the ultra high-compression ratio of 22.5:1. GM after a few years fixed this along with some other issues however it was by then too late word had gotten out, and most buyers had also lost interest in dirty smokey diesel motors in general (even Mercedes was scaling back on its diesels for the U.S. market). However even those lucky diesel equipped Eldorado buyers who didn’t have any reliability issues still were plagued with slow acceleration times – 0-60 mph happened in a very long 16.8 seconds and a 1/4 mile in 19.8 seconds. Acceleration may have been smooth, but gave the driver at times the impression that jumping out of the car and running was faster to get to a destination than ramming the accelerator to the floor. When it came to the interior the Eldorado delivered the goods, it was more luxurious than any previous Eldorado and included a whole host of standard options, and what wasn’t standard was optional. 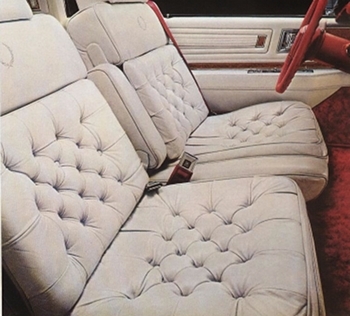 The Cadillac Eldorado for 1979 had an interior every bit as luxurious as Cadillac’s premier luxury car – the Seville. In fact so much so, many buyers who liked the (four door) Seville but preferred a two door now were buying the Eldorado. Many of the standard features were years ahead of most cars such as the twilight sentinel (Cadillac’s way of saying headlights and taillights that turned on and off automatically), Electronic tuner radio with digital display, automatic power antenna, illuminated entry system, and an automatic climate control system. However these were still the good times at GM and Cadillac was managing to do the impossible. Even though the Eldorado had shrunk in size Cadillac still managed to increase most of the interior dimensions of the Eldorado – the Eldorado was extremely roomy with improved front and rear legroom and headroom. The only area where space was lost was in the interior width. And amazingly the trunk space also grew in size where the previous Eldorado had 13 cubic feet of space, the 1979 had 75 percent more space – a whopping 19 cubic feet of trunk space. There were three different Eldorado trim packages: the base which Cadillac referred to as the Classic Coupe, the Cabriolet, and the Biarritz. The Cabriolet was a step above the Classic Coupe while the Biarritz was the ultimate in luxury. The base Eldorado was laden with lots of exterior chrome trim, the Biarritz added even more. The Biarritz also came standard with a brushed stainless steel roof just like the one first scene on the 1957 Cadillac Eldorado Brougham. And the Biarritz’s interior compared to the other two Eldorados (which were luxurious) was nothing short of opulent. Two tone exterior paint schemes were also available on the Eldorado, which accented the body well and further conveyed the upscale nature of this new Eldorado. There was also an available astroroof on all Eldorado models which electronically opened and closed a large laminated glass roof panel to give occupants a pleasurable open air experience. The astroroof came standard with a sliding shade. For those who didn’t want the lamented glass, a sunroof option which replaced the glass with a metal panel the same color as the rest of the roof was available. The sunroof was available on all Eldorado models except the Biarritz. Cadillac touted the Eldorado in its 1979 sales literature as "one of the world’s best engineered cars". It wasn’t lying. Cadillac spent a lot of money engineering the new Eldorado. It didn’t cut corners and the final product was loaded with many state-of-the-art engineering advancements. As mentioned previously both of the Eldorado’s engines used electronic fuel-injection, when most of its competitors were still using a carburetor. The Eldorado also had a four-wheel independent suspension which gave the Eldorado a comfortable ride that absorbed most of the shock of potholes and road imperfections. The independent suspension in the rear took up less space than the solid axle of the previous year which gave the 1979 Eldorado more rear seat space and bigger trunk space. Not many cars back in 1979 had a four wheel independent suspension – even if you did find this type of suspension on a car back then, it was usually found on a very expensive sports car. Another standard feature of the 1979 Eldorado not usually found on luxury cars of its day were four-wheel disc brakes which had been standard on the Eldorado since 1976. The auto press back in 1979 was jumping for joy when the 1979 Trans Am had a new four-wheel disc brake option, but not much fuss was made about the Eldorado’s standard four-wheel disc brakes. Cadillac could have saved some money and not offered four-wheel disc brakes or an independent suspension and probably still sold as many Eldorados as it did, but Cadillac was committed to making the Eldorado a state-of-the-art car and it didn’t skimp in any way. The Eldorado had front-wheel drive since 1967 – a system that was originally designed by Oldsmobile for its 1966 Toronado. It was a fantastic system which was reliable and didn’t suffer from torque steer. When many automakers went to front-wheel drive in the 1980s, these systems tended to be for small and mid-sized cars and corners were cut to keep costs down and many of these systems suffered from torque steer. The 1979 Eldorado’s front-wheel drive system was still the upscale system as in past Eldorados however now instead of sharing it with just the Toronado, the Buick Riviera now used the same system in 1979 (the newly downsided 1979 Eldorado, Toronado, and Riviera all shared the same platform). Front-wheel drive gave the Eldorado a flat floor (no drivetrain hump in the center of the floor) which gave the Eldorado a more roominess feel than its rear wheel drive competitors. One interesting notation is that since the 1979 Eldorado had a standard V8 engine with enough grunt, an four-wheel independent suspension, four-wheel disc brakes, and even optional sporty lightweight aluminum wheels – all of which provided a great performance pallet for Cadillac to have offered a sporty Eldorado model which would have been a true European luxury performance type touring car. Cadillac could have given this Eldorado model’s suspension some performance tuning – stiffer shocks, a few anti-sway bars, performance tires, a performance oriented steering box, etc. This would have certainly put Cadillac ahead of the curve and solidified Cadillac not only as a luxury leader but also a luxury performance touring car leader. To Cadillac’s credit it did offer this type of performance tuned suspension on the Eldorado for 1981 however by that time the 170 horsepower 5.7 liter V8 was gone, and the notorious (6.0 liter) 8-6-4 V8 with only 140 horsepower was the Eldorado’s mot powerful engine. Even more sad was that Cadillac offered starting in 1982 an Eldorado Touring Coupe which used the previous year’s optional touring suspension. The Touring Coupe replaced a lot of chrome with body color or black colored accents and had a set of European looking aluminum wheels – the exact look you would expect from a European touring car. Even the hood ornament was replaced with a hood badge. The Eldorado with the 1982 Touring Coupe now had all it needed to put the best of the European luxury touring cars in their place except for the engine – its hottest motor was the anemic 125 horsepower 4.1 liter V8. If Cadillac had really been insightful, it would have used Buick’s 175 horsepower 3.8 liter turbo V6 instead, after-all the 1982 Eldorado was available with Buick’s 4.1 liter V6 which also produced 125 horsepower. The turbo 3.8 liter V6 would have given the 1982-1985 Eldorado Touring Coupe the performance grunt it desperately needed to go head-to-head with the best Europe had to offer at that time. Ironically Buick did offer the turbo 3.8 liter V6 in a T-type version of its Riviera during this time however it really didn’t advertise the car and sales were limited. The 1979 Eldorado was the completion of Cadillac’s phase 1 of downsizing its entire lineup. It was a great success, and the new 1979 Eldorado further solidified Cadillac as king of the luxury cars. Cadillac was still ahead of its competitors including even Mercedes, BMW, and Jaguar. Just to put this into perspective total U.S. Cadillac sales for 2010, which was a good year for Cadillac, was 146,135. Back in 1979 Cadillac sold a whopping 215,101 De Villes alone and that doesn’t count all the many Eldorado, Fleetwood Broughams, and Sevilles it sold the same year. You can bet GM would love to see sales like this again which the 1979 Eldorado was a big part of. Unfortunately Phase 2 of Cadillac’s downsizing in the mid-1980s would shrink the Eldorado and most of the Cadillac lineup to Mini-Me size proportions and sales went on a downhill slide for many years thereafter. Cadillac has rebounded in recent years however sales have never recovered to anything remotely close to its 1979 model year sales. Cadillac read correctly what customers wanted back in 1979, and it really delivered with the Eldorado. It’s no small wonder why the Eldorado was such a big success even during the bad economic times of 1979. Many have forgotten this gem of yesteryear, a car that put a lot of money in GM’s coffers. So if you are a collector or hobbyist looking for a reasonably priced classic Cadillac, you need not look any further than the elegantly styled 1979 Eldorado – today it’s one of the best classic car bargains you’ll find out there. And it will remain so as long as it continues to fly under the radar screen.